An example of the tattooed fruit and vegetables. Source: Matthew Abbott. 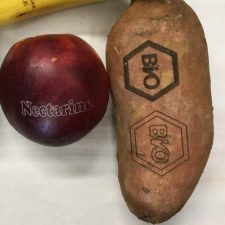 Tattoos on fruit and vegetables are set to become the norm following an increased call for less plastic and packaging in supermarkets. Farmers are reportedly continually seeking out environmentally-friendly alternatives to plastic for produce that already comes in a natural packaging. Fruit with printed skin instead of stickers are already in use across Spain, Sweden and the UK. Matthew Abbott from far-north Queensland is among those pursuing the alternatives. “One of the big problems that we have at the moment is being able to brand our fruit so we can sell conventional and organic side-by-side in the shop,” Mr Abbott said. “One of the things I found was a machine that uses laser technology to write on the fruit,” he said. Mr Abbott told the ABC that as long as the laser is set up at least 30 centimetres away from the produce, the branding will not penetrate the skin or affect shelf life. Mr Abbott is continually working on the laser technology for his produce, saying the initial outlay of money for the laser machine is expensive but over time would approve more cost effective than stickers or plastic.